The ideal replacement service for traditional lines services such as ISDN. Make significant savings on installs, line rental and call costs compared to traditional BT lines. Faster to deliver and scale up and down easily. Open new sites quickly, operate telephone number ranges wherever you need them, present alternative telephone numbers to callers and deliver inbound calls anywhere. SIP Trunks from Columbus include a fully automated divert plan as standard plus optional resilient designs which allow you to route calls between sites easily and quickly. Then SIP Trunks from Columbus are the right choice for your business. Call us on 0333 240 7755 and we'll get you set up in a jiffy. 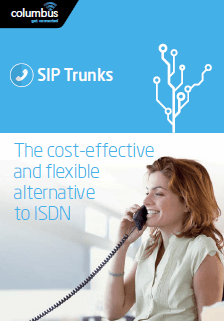 SIP Trunks provide far more than a traditional business telephone lines. Take advantage of the latest communications technology with intelligent call routing, flexible telephone numbering, inclusive calls and comprehensive Disaster Recovery options. SIP Trunks and Hosted Business Phone Systems are the fastest-growing telephony services in the UK and Columbus provides leading solutions for both markets. Columbus Business SIP Trunks offer a cost-effective and reliable alternative to ISDN, whilst providing superior flexibility and comprehensive service continuity options to safeguard your business critical call traffic at all times. SIP Trunks – are they right for my business? Columbus provides total flexibility when it comes to the numbers you want to use for your SIP Trunk service. You can keep your existing numbers or get new numbers. You can also extend your business reach and use any local area numbers no matter where you are located. With our CLI Flexibility service you can also use any telephone number to display to called parties. One of the biggest benefits is that unlike traditional business telephone lines, you won’t lose your telephone numbers if you move out of your local exchange area. Compared to BT ISDN30, using Columbus Business SIP Trunks will save you a very significant sum on installation costs. This could be a saving of 90% or more based on the installation of a BT ISDN30 bearer with 30 channels on a 12 month contract term (BT pricing checked 03/12/15). One of the other major benefits for UK SME customers is the immediate and significant reduction in operating costs. By utilising Columbus Business SIP Trunks you could save up to 50% on line rental compared to BT ISDN and up to 25% on call charges. Customers with multiple sites also benefit from free calls between sites. Compared to traditional line services, the benefits of SIP Trunks are many and varied which includes reduced set up costs, faster service delivery, better value line rental and call charges, greater service and telephone numbering flexibility, vastly superior Disaster Recovery capabilities and much more besides. Columbus provides end-to-end support for our SIP Trunk and access solutions meaning one supplier for PSTN lines, broadband, router, SIP trunks, telephone numbering, diverts and Disaster Recovery plans saving you hassle, time and money. If you want exactly 3 lines, you can have just that. You only pay for what you need on a simple channel rental basis and the minimum number of channels you can order is just 2 compared to 8 on ISDN30. This is great for businesses that would otherwise pay for traditional line services they do not use or require but are forced to, due to the minimum channel commitment on traditional ISDN30 services. For larger businesses that need to scale the number of channels required up or down and do so quickly during peaks and troughs in business, SIP Trunks are perfect for this scenario. You can have as many SIP Trunks as you require without any additional charges to increase or decrease the number of channels required. Unexpected events such as snow, floods and power failures won’t disrupt your business. Because our SIP Trunk service sits in the “cloud”, the service provides Disaster Recovery features that allow your organisation to carry on receiving calls whatever the occurence and nature of the unexpected event. Traditional business lines just cannot provide the same level of service or functionality without going to great expense. Columbus Business SIP Trunks connect your sites directly to the Columbus IP network via a broadband access service. This provides a reliable and dedicated means to carry voice calls across the public telephone network. The service is delivered as an ‘end-to-end’ service with an availability guarantee, voice channel and quality of service guarantees. 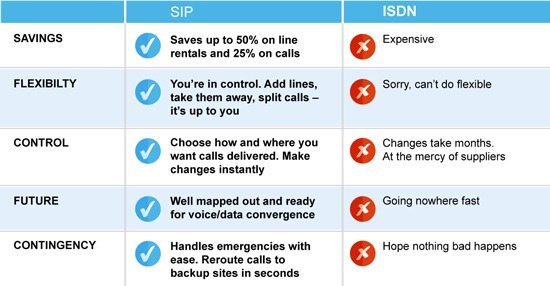 How do SIP Trunks differ from ISDN2 and ISDN30 lines? Compared to ISDN lines the Columbus SIP Trunking service is less costly per channel and more flexible in how and where geographic telephone numbers can be used. It’s also quicker to deliver and provides very robust business continuity features as standard. The service can support businesses that require as little as two channels which operate small business phone systems to an unlimited number of channels for large organisations and contact centres. Not only will you save on your line rental and call costs, but you’ll also benefit from free internal calls which is great for businesses with multiple sites. SIP trunks are ideal if you are moving, upsizing or downsizing and want to keep your existing numbers. You can scale up lines during busy periods and back down again afterwards. You can add lines, take them away, split calls at any time. You are always in control. SIP trunks can handle emergencies easily. They are inherently disaster recovery / business continuity ready, letting you route calls to alternative locations quickly and easily. Is my phone system compatible with Columbus SIP Trunks? Columbus SIP Trunks have been conformance tested with all of the UK’s leading IP PBX manufacturers. Some of the IP PBX and SIP Gateway vendors we work with are illustrated below. To check PBX interoperability, call Columbus on 0333 240 7755. Are Columbus SIP Trunks compatible witn Skype for Business (formerly Microsoft Lync)? Skype for Business delivers a simple and fast communications platform for businesses that lets you instantly see any colleague’s presence status and communicate with them using instant messaging, conferencing and voice. The visibility provided by Skype for Business helps businesses reduce operating costs and time wasted by chasing colleagues that might otherwise be engaged. Columbus SIP Trunks are fully tested and compliant with Skype for Business. This provides a direct connection from the Columbus Business SIP Trunks to your Skype for Business environment which allows you to make and receive external calls. What happens if my service is unreachable? Columbus Business SIP Trunk solutions offer robust business continuity options not available on ISDN to ensure your business never loses any calls. The Columbus active/standby and load sharing SIP Trunk solutions are designed to cope with any potential downtime situation; whether you need to keep your organisation running during an unplanned emergency without the high cost of call forwarding or simply need to balance call volumes between sites during busy periods, Columbus’ ‘resilient design’ SIP Trunk solutions deliver the continuity of service you need to keep your business operational whatever the circumstances. Like to know more about SIP Trunks? Talk to an expert. Call Columbus on 0333 240 7755. Let's go!